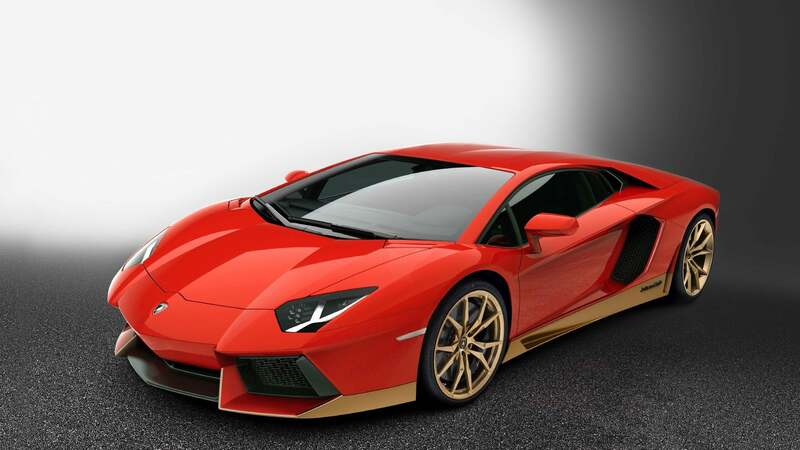 "Three-quarter view of a red Lamborghini Aventador Miura with gold band and rims, parked on the asphalt. " Cropped image of a red Lamborghini Aventador Miura with close-up of the rear wheel with gold rims. A brand-new and thoroughly original edition is born. A special edition Aventador Coupé which pays homage to the 50th anniversary of the Miura, the historic forerunner to Lamborghini's V12 super sports cars, through a design which combines history and style. With only 50 units to be made, the Aventador Miura Homage proves that Automobili Lamborghini looks to the future without forgetting its roots. The image shows a blurred close-up image of the plaque reading: Miura Serie speciale 1 di 50. The Aventador Miura Homage was created by the Lamborghini Ad Personam Studio with even the smallest details inspired by the Miura: the single-color upper part of the body, available in the Miura's original 18 colors, contrasts with the lower part available in gold or matte silver. The Miura logo in black steel on the side, the Limited Edition plate inside the vehicle and the Miura 50th logo sewn onto the upper part of the seats all clearly define the exclusive character of the Aventador Miura Homage.